Florida’s marine waters are home to a number of invasive species. Read more to learn about how two common invasive species in Florida affect coastal and marine ecosystems. 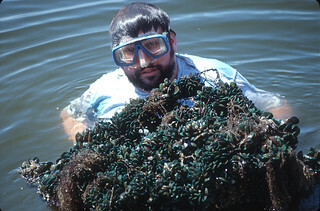 Green mussels, Perna viridis, are non-native bivalve mollusks which have invaded the coastal marine waters of Florida. Evidence for the presence of this invasive species has been found on both the Gulf and Atlantic coasts. Read about green mussels in Tampa Bay. The lionfish is a species of reef fish easily recognized by a striking display of red and white zebra striping and protruding venomous spines. They have proliferated in the Caribbean, the southern Atlantic off the U.S. coast, and the Gulf of Mexico. Biologists believe they were probably introduced when aquarium owners emptied unwanted pet lionfish into nearby coastal waters. 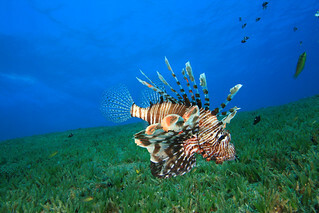 Three lionfish research projects were funded by Florida Sea Grant.